It’s a New Year Treat! Happy New Year to all my lovely blogees! And thank you for helping me out with my miniature dummy board figures before Christmas. I only have a very few left now…and will try to use these as prizes in a little quiz that I am about to run here on PastMastery. I also have a few photographic ones still hanging about. If you would like to have one ..please refer to this post ( bottom) to see what they look like, let me know and they will be on their way to you. All I need is the price of the postage and you can send that in stamps. E mail me and I’ll let you know how much your parcel costs. They are of no use to me and I would rather they decorated a dollshouse somewhere than go in the bin! The hand painted ones are no use to me either…someone must have them! And so….Now for my little 2011 quiz…. Mrs Anne Osborne has this one now. 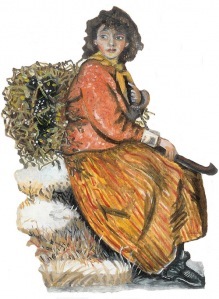 The poor lonely lady from the theatre pair. 4 ins. Lady with red rose 5 ins. Miss Angela Newstead ( no relation ) picked this one. And I have decided to give away all my photographic figures as prizes when the real ones have gone, too! ONLY THREE REAL ONES LEFT NOW! Somebody must like Mozart or The Red Rose Lady or The Mistletoe Girl. A mystery object...No! you can't have it any bigger! WINS IT! 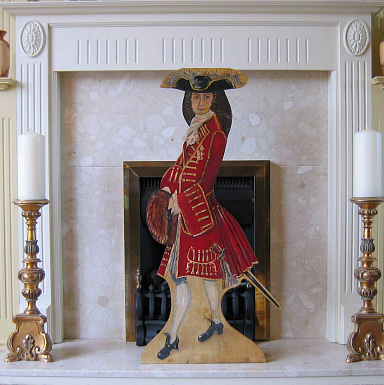 AND WITHIN THE HOUR MARY WILLIAMS HAD SUPPLIED THE CORRECT ANSWER OF THE OUDRY FIREBOARD. SHE WINS IT! You all know that I have painted over many years, replica figures of life sized dummy boards from collections all over the place. These have been for sale on the website and have come and gone over the 9 years or so I have had PastMastery. A lady emailed me before Christmas to make inquiries about having one of them for her Mother as a present. 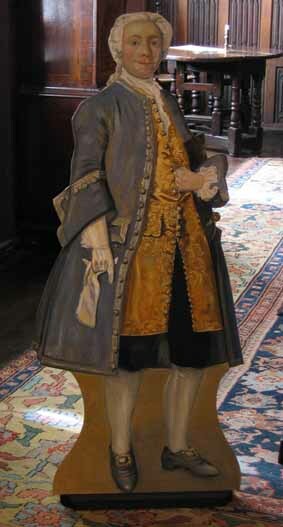 It was the figure which is one of a pair housed in the National Trust collection at Chirk Castle in the north of England. I call these two 17th century figures Matty and Toby. 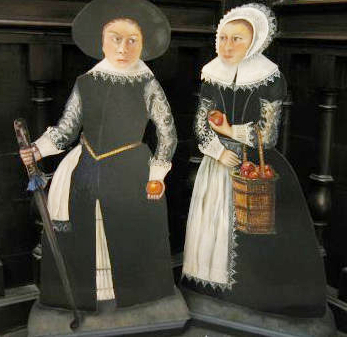 They are Dutch children, c.1600. The boy with a rudimentary golf club and the girl with a basket of apples; one seems to be doing service as a golf ball. They are dressed in the typical costume of the well to do middle classes seen in the paintings of the age, plenty of lace. Of course the young man wears skirts as did all the young boys of his age.We think, by the expressions on their faces that they are “up to no good”! Northamptonshire, England, which is contemporary with them of course. Duly, this figure was parceled up and sent into deepest darkest Kent! My customer was so delighted with it, that, this week, this lady emailed and has ordered Toby as well. And guess what? She has also got a place for Humphry Clinker and for Sir John Thursby too! Humphry is a fanciful evocation of the character from Tobias Smollett’s novel ” The Expedition of Humphry Clinker ” – a very funny book ( I urge you to read it ). Here he is seen in the Oak room- a panelled dining room in his own house of Ablington, in Northants. John was a real person and he owned Ablington Manor near Northampton. I painted him from a portrait which hangs in the house, for a special exhibition as part of Open Studios week in 2005. His beautiful two tone blue/ gold coat was a challenge to paint as was the lovely brocade of his waistcoat. Well… as you can see…for me it IS a Happy New Year! It’s working a treat! Hope it will be for you too…. when you win my competition! This entry was posted on 03/01/2011 at 6:15 pm and is filed under Uncategorized. You can follow any responses to this entry through the RSS 2.0 feed. You can leave a response, or trackback from your own site. My dear S&S, ‘Tho flattered immensely by the Likeness which you have so cleverly Wrought, it must needs be said that my name is Complete&Ssufficient without the common vowel. With warm regards and admiration for the Artistry so abundantly evident here, I am, Yrs&tc., Humphry C.
Thank you so Much Humphry!. I stand corrected….. I have Looked at your name often and (mea culpa ) never Noticed the Absence of the common vowel! Ah well..it is Amended. No Offence intended. I too remain your faithful servant.